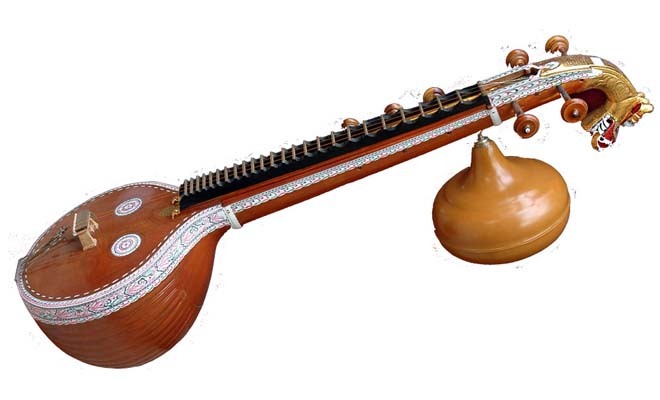 Veena: Veena is a musical string instrument. Considered as an instrument for Gods like Saraswati, Narada, Veena is a very ancient instrument mentioned in Rigveda, Samaveda and other Vedic Literature. The word Veena is a Sanskrit word. Veena has been mentioned and discussed in Natya Shastra which is an ancient test for performing arts. It was written by Barata Muni. There are different types of Veena. Rudra Veena, Saraswati Veena, Vichitra Veena. It is believed that Rudra Veena was created by Lord Shiva and the Saraswati Veena is an instrument of Goddess Saraswati. Saraswati Veena is an important instrument for Carnatic music. Ghatam: Ghatam is a clay pot with narrow mouth. It is one of the oldest percussion instrument used in Carnatic music in South India. Percussion instrument means the sound is produced by the beater either by hitting or rubbing their hands. It is manufactured near Madurai, a place called as Manamadurai. The pot is kept on the lap of the performer and with the help of their hands, fingers, palms and heels of hands the performer strikes the outer surface of the clay pot to produce different sounds. Some of the notable performers are Ghatam Udupa, Kothandarama Iyer, Sukkanya Ramgopal and many more. Mridangam: Again Mridangam is also percussion instrument. It is very important for classical music and dance. This is the important and main instrument which provides rhythm to music and dance. It is made up of a hallowed piece from jack fruit wood and on both sides it is covered with goat skin. The goat skin is covered with a mixture of rice flour, ferric oxide powder and starch. This mixture is called as satham. 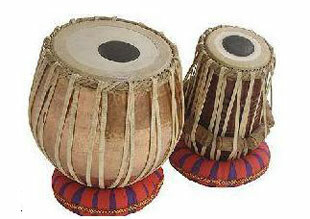 Mridangam is bulged at the centre and narrowed at the sides. Before any performance water is applied on the mixture which lowers the sound and the pitch of the left membrane. It is usually kept on the floor while right or left foot is kept on the mridangam for support. Sarangi: It is one of the oldest and most popular string instruments used in Hindustani classical music. It has a hollow body made up of cedar wood. There are 37 sympathetic strings and 3 gut strings that pass through it. The three main strings are thick and bowed with horsehair and are stopped with nails. The sympathetic strings are made up brass or steel. Some famous sarangi maestros are Ustad Sultan Khan, Gulham Sabir, Rehman Bakhs and many more. 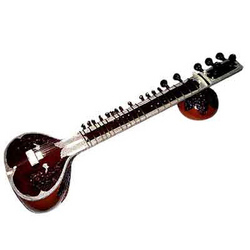 Sitar: It is a plucked string instrument which is very popular in Hindustani music. Sitar is of two types the instrumental sitar and the gayaki style sitar. The gayaki style is simple and is made up of toon wood. Gayaki style consists of 11 to 13 sympathetic strings. It has no decorations on it while the instrumental sitar is fully decorated with carvings. In instrumental style it consists of 13 sympathetic strings. Sitar has a long neck with around 20 frets (a raised element on the neck of stringed instruments) and has around 20 strings. 6 to 7 strings are playing strings and the remaining are sympathetic strings. These 6 to 7 playing strings run above the frets and the remaining sympathetic strings run below the frets. The frets are moveable and help in tuning. Usually sitar is balanced between the players left foot and right knee while performing. Famous sitar players include Pt Ravi Shankar, Pt Debu Chowdary, Anoushka Shankar, Nikhil Banerjee and many more. Shehnai: Shehani is a wind instrument made up of long wood with double reed (a type of reed used for producing sound) on one side and a metal bell on the other side. It is usually used during the auspicious occasions like marriages or in temples. The long wood has holes where the player keeps fingers on the holes to make different sounds. Some famous shehnai players are Bismillah Khan, Gauri Shankar, Daya Shankar and many more. Harmonium: It is also called as reed organ. 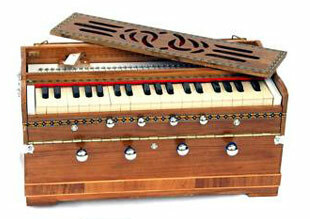 Harmonium is a keyboard instrument which is widely used in all kind of classical music especially in Hindustani music. Harmonium consists of wooden body, keyboard and bellows. It is played by pressing the keys on one hand and moving the bellows from the other hand. The keys are adjusted with different tones. Flute: Flute is a small wooden wind instrument that produces sound through the passing of air from the opening. It is kept horizontally near the mouth. It is slightly bend at the end. It consists of various holes the player has to keep fingers on the holes to get the melodious sound. This causes vibrations inside the flute. It is linked to Lord Krishna. Some famous flute players are Hariprasad Chaurasia, Rasika Shekar, N Ramani and many more. There are many more musical instruments in India.